Hewlett-Packard (NYSE Ticker Symbol: HPQ ) is a company with a market capitalization of $97 billion dollar and its stock dropped 10 percent on news that HP CEO has resigned. The reason for Mark Hurd's resignation is because of sexual harassment charges. But there is more. The board of directors hired investigators to look into the matter and the investigators found discrepancies on Mark Hurd's expense reports. How does one interpret this? Had he lied on his expense tab? Was he was using the shareholder's dime on his sexcapades? Isn't this a white collar expense fraud? Why is the board of director rewarding Mark Hurd with a severance package of 12.2 million in cash and $16 million in stock? Is Hewlett-Packard's Board of Directors really looking after the shareholders interest? 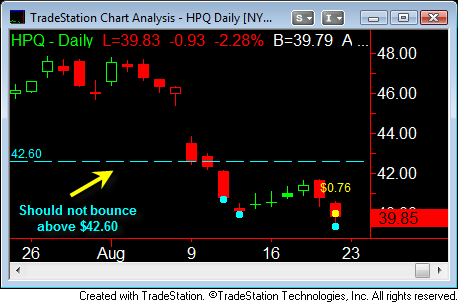 Hewlett-Packard HPQ is setting up for ACD Method stock trading. The events above and the following are setting up Hewlett-Packard for ACD Method stock trading environment. Portfolio Managers are telling the public this is a buying opportunity. Portfolio Managers who have Hewlett-Packard in their holdings say HPQ has dropped too much and they don't want to sell it here at this price after such a drop. Portfolio Managers are buying hope. Hewlett-Packard is scheduled to announce earnings on August 19, 2010 after the market close. Portfolio Managers are hoping the price will recover back up on the earnings announcement. Fundamentally, the Portfolio Managers are correct. One man does not make a company. Mark Hurd is no Steve Jobs. The general public doesn't think of Mark Hurd when you say HP unlike Apple where Steve Job is the visionary driving force for the company's success. It's incredulous that one man or one woman can wipe out over $9 billion dollar in one day. It's too much. A bearish bias is established. Your "I know this is where I am wrong" is $45.75. If a bearish bias is to be correct, price cannot bounce back up to $45.75. Look for signs of Failed A-Up, to get short. Be wary, the few days just before HPQ earnings announcement. Traders who wanted to be short have established their short position by this time. Watch out for late day C-Up going into earnings day. Hewlett-Packard announced earnings results after market closed on Thursday night. Earnings came in at $0.76. The stock sold off on Friday morning to a new 52 weeks low. Portfolio managers who were hoping for a bounce from the earnings announcement are disappointed. Wall Street were selling hope and they were buying it. They are finally coming into the realization that they should have been on the sell side after HPQ gapped down on Aug. 9, 2010 instead of thinking that Hewlett-Packard was oversold. 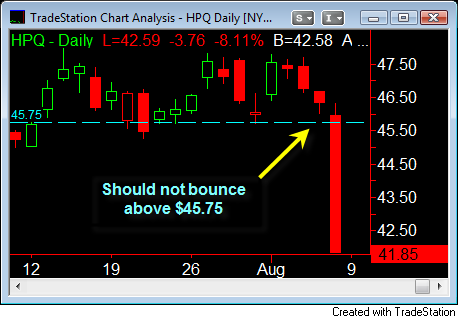 Price continued to drop since my previous Aug. 9th blog post on Hewlett-Packard. A bearish bias is maintained. Your "I know this is where I am wrong" is $42.60. If a bearish bias is to be maintained, price cannot bounce back up to $42.60. Look for signs of Failed A-Up, to get short. Portfolio managers must decide if they still want Hewlett-Packard on the books before the quarter end. Will they do window dressing and sell their HPQ holdings to avoid questions from their investors or will they stick to their guns and say Hewlett-Packard is oversold?